Waterfall in spate is a Helen Melvin original landscape in naturally dyed felt, fabric and paper and machine stitch. The Waterfall is an unique Helen Melvin Landscape made with a method of wet felting developed over twenty years five of felt making and combines wool fibres with silk fabric and fibres to create movement and texture, . 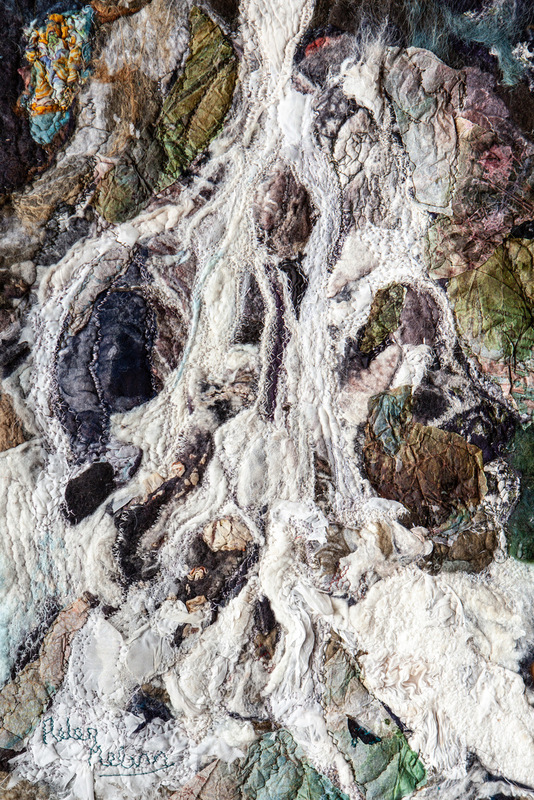 On top of this layers of felt, fabric and papers are added with stitch or stitch alone which is also used to emphasise movement as well as the power of water. The inspiration of this picture, comes from the many waterfalls in the North Wales landscapes and show the power of nature coupled with the view of water in the Tao Te Ching . Here Tao ( the Way ) is seen as the way of water. The picture is 30cm X 35cm , the antique white mount is 6cm wide with 7cm at the bottom. The width of the textured frame which has with highlights of pastel , blues, yellows and reds is 2.5cm. the mount and frame are carefully chosen to provide a clean contemporary feel to compliment the modern home. The overall dimensions of the picture 48cm by 64cm and the weight is 2.1 kg. Mounted and framed with handcrafted frames from the Cathedral Framers in St Asaph, each picture is despatched in a hand build wooden frame and are despatched by courier world wide.